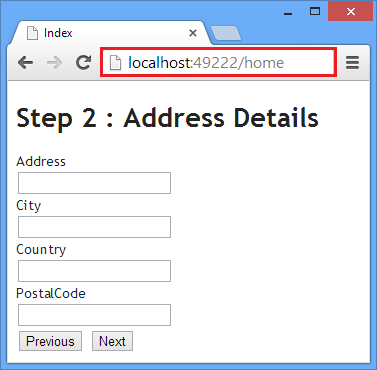 In Part 1 of this article series you developed a wizard in an ASP.NET MVC application. Although the wizard developed in Part 1 works as expected it has one shortcoming. It causes full page postback whenever you click on Previous or Next button. This behavior may not pose much problem if a wizard has only a few steps. However, if a wizard has many steps and each step accepts many entries then full page postback can deteriorate the user experience. To overcome this shortcoming you can add Ajax to the wizard so that only the form is posted to the server. In this part of the series you will convert the application developed in Part 1 to use Ajax. In the next part you will further enhance the wizard using jQuery so that data is posted to the server only on the final step. All the four views namely BasicDetails, AddressDetails, ContactDetails and Success will now be partial views. All the action methods will now return the corresponding partial views. The wizard will be launched by Index view and initially BasicDetails partial view will be displayed. You might wonder as to why we are making these changes. These changes are required since we wish to use Ajax helper. The Ajax helper allows you to submit a form using an Ajax request and the returned response is displayed in a DOM element. For example, you may create a form that makes a post request to an action method and displays a success message returned by the action method in a <div> element. In our specific case when one wizard step is submitted to the server using an Ajax request the server responds by sending the next or previous wizard step. Thus a form submits to the server and renders another form in the browser. This requires that the wizard steps return only the HTML needed to display that step and not the page level items such as <script> and <link>. The page level items just mentioned will go inside Index view that launches the wizard. Notice the above markup carefully. The <head> section of the page contains <script> references to jquery-1.10.1.js and jquery.unobtrusive-ajax.js. These files are necessary for the proper working of Ajax helper. Also notice that the body section contains a <div> with ID of divContainer. This <div> plays an important role in the functioning of the wizard because it houses various wizard steps. As you can see from the code initially it hosts BasicDetails partial view. The BasicDetails partial view has BasicDetails class as its data model. It creates an instance of AjaxOptions class. The AjaxOptions class is used to supply various configuration settings while using the Ajax helper. In this case we set HttpMethod, InsertionMode and UpdateTargetId properties. The HttpMethod property indicates the form submission method and it is set to POST in this case. The InsertionMode and UpdateTargetId properties are very important for us. The UpdateTargetId property indicates an ID of a DOM element that will be updated with the response returned from the server. In our example UpdateTargetId is divContainer, the <div> element you added inside the Index view. The InsertionMode property governs how the server response should be added to the UpdateTargetId. The InsertionMode has three possible values - InsertAfter, InsertBefore and Replace. In our example we wish to replace the whole content of divContainer with the response (i.e. a form making a wizard step) and we set it to Replece. Then a <form> is rendered using Ajax.BeginForm() helper method. The BeginForm() method accepts three parameters viz. action method name, controller name and AjaxOptions object. Inside it contains the same markup as the earlier example (see Part 1 for more details). Notice that all the partial views that use Ajax helper declare their own AjaxOptions object and pass it to BeginForm() method. As you can see there is no change in the logic of the action method. The only difference is that instead of View() method it uses PartialView() method. Also change AddressDetails() and ContactDetails() action method to return partial views instead of views. If you run the wizard you will find that even after navigating to different wizard steps the URL in the browser's address bar remains unchanged indicating that Ajax requests are being made to the server rather than full page postback. As you can see even if you are on Step 2 the address bar still points to /home/index. That's it! In the next part you will learn to develop a wizard that replies more on client side technologies and posts data to the server only at the last step.